Marsalis' Sharp Social Critiques Come with Cool Riffs Every decade or so, jazz trumpeter Wynton Marsalis says, he makes a political album. From the Plantation to the Penitentiary is his latest. The songs criticize hip-hop culture, a lack of strong black leadership and materialism. 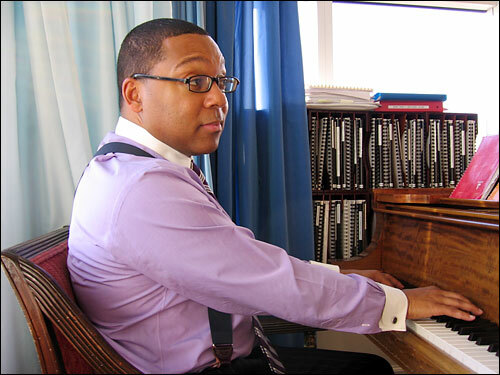 Wynton Marsalis plays his Steinway baby grand piano at his home in New York. His latest CD is From the Plantation to the Penitentiary. 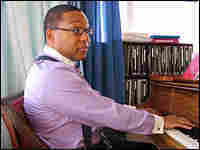 Every decade or so, says jazz trumpeter Wynton Marsalis, he likes to set his social views to music. The last time around, it was Blood on the Fields, which won the 1997 Pulitzer Prize in music, a first for a jazz composition. Marsalis is playing the role of provocateur again with his latest CD, From the Plantation to the Penitentiary. The songs criticize hip-hop culture, what he sees as a lack of strong black leadership, and an abundance of "gimme-that" materialism. In New York, Marsalis directs the Jazz at Lincoln Center program. From his apartment just up the street, he talks to Michele Norris about his newest release, why lyrics rather than the trumpet take center stage, and what his teenage son thinks about some of the songs.